21 July 2017 “The nice thing about this way of working is that you lose an element of control. 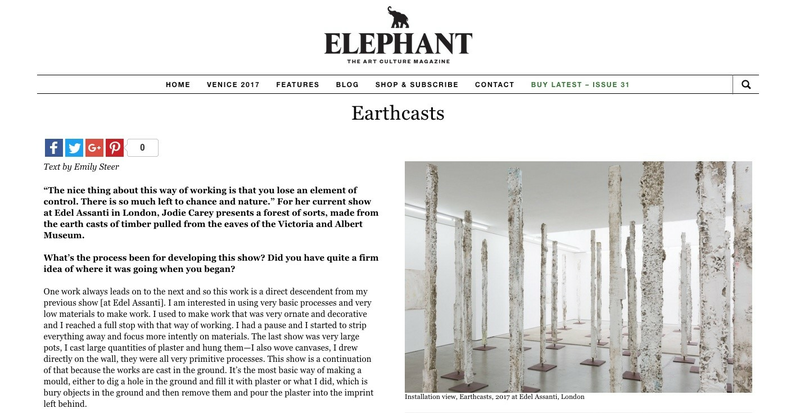 There is so much left to chance and nature.” For her current show at Edel Assanti in London, Jodie Carey presents a forest of sorts, made from the earth casts of timber pulled from the eaves of the Victoria and Albert Museum. What’s the process been for developing this show? Did you have quite a firm idea of where it was going when you began? One work always leads on to the next and so this work is a direct descendent from my previous show [at Edel Assanti]. I am interested in using very basic processes and very low materials to make work. I used to make work that was very ornate and decorative and I reached a full stop with that way of working. I had a pause and I started to strip everything away and focus more intently on materials. The last show was very large pots, I cast large quantities of plaster and hung them—I also wove canvases, I drew directly on the wall, they were all very primitive processes. This show is a continuation of that because the works are cast in the ground. It’s the most basic way of making a mould, either to dig a hole in the ground and fill it with plaster or what I did, which is bury objects in the ground and then remove them and pour the plaster into the imprint left behind. What appealed about working with casts, rather than simply the items that were buried? There is so much transformation in the casting process. The actual object was timber from the V&A museum [in London]. It came from way up in the eaves and it had been up there for decades. It was used to build storage for casts that weren’t displayed in the museum. So, the originals are lengths of old timber and then when you bury and remove them and pour the plaster in, the plaster picks up all the detail of the soil and detritus. It’s engaging not only with the object that you’re casting but also the soil itself. By using soil you’re engaging with other ideas such as geology and concepts of entropy and decay and time passing. Was there a significance to the place you chose to bury it? I worked at my studio. Every soil is different because it is particular to its landscape—so things like climate, vegetation and human activities that have gone on there. I used a number of pieces of timber but even if I’d used the same piece, every cast would have been unique depending on how wet the soil was, whether it had rained the night before. I also worked into the wood slightly. How do you balance your own interventions and mark making—before and after casting—with the natural process? Is there something that you feel leads you? I used to be very controlling and things I used to make were so literal, they were instantly recognizable as something that belonged to the world. The nice thing about this way of working is that you lose an element of control. There is so much left to chance and nature. I didn’t want to work into the wood too much but I did want there to be some elements, that idea of the primitive carving into the wood. It was very subtle. Your pieces require quite a lot of physical work and unusual techniques. When you try new methods, do you teach yourself from scratch or go to experts? It tends to just be me and my boyfriend. When we were pouring the plaster [for Earthcasts], it was nineteen bags of plaster and you only have a limited time to mix the plaster and pour it before it goes off. So we had all these buckets set up with thirty litres of water in each one. And then it’s go, go, go! It was like a Paul McCarthy video by the end of it, there was plaster everywhere. Because the casts were so huge we had to climb up steps holding these buckets and pour them over the edge in this limited ten-minute window. We’ve done some very dangerous stuff. But I really like that way of working, it stops you from being precious about the object and allows you a lot of artistic freedom. You’re not caught up in the tiny details. It’s a gesture or expression. It’s also about capturing a moment. I think that’s much more exciting than something you’ve envisaged and then spent six months making. I always like my shows to feel like a maker’s show. 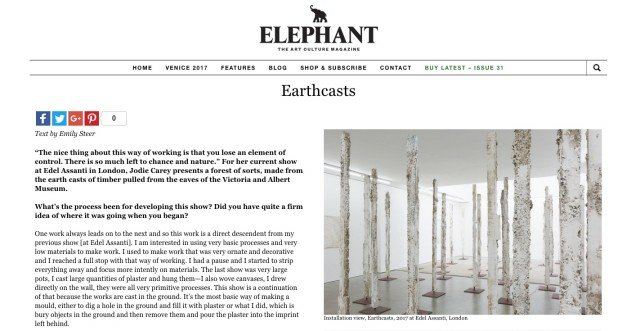 The work sits on quite a few borders, one of the most notable is natural and manmade—as you’re walking through the installation it looks like a forest of trees but also telegraph poles that have been left to rot. Do you consciously play with those borders? I think the work does a lot of that itself. I envisioned a forest of sculptures while I was making it and they really look like trees, more than I thought. A lot of people have said they look like silver birch trees. Because of their scale there’s also something that recalls the human figure. I didn’t deliberately set out to make that but it’s just how the work develops and takes on its own life. The viewer completes the work. They bring their own imagination or knowledge and memories to a work and complete it in a sense. The installation really makes the most of the light that comes through the ceiling in the back half of the upstairs gallery, and also works well with the gallery’s characterful floor. It almost begins to feel like part of it. I have done a number of floor pieces and I think it’s really nice for an installation to engulf you. I have worked with smells before and involved other senses. I did envision these all facing forward in the space—they do have a front and a back because they’re open cast—and I realized once we had them up and the spacing sorted that it was almost a bit too military and it also really affected how you felt when you walked around. It was as though you went from the front to the back and then there was no point hanging out there. I started turning them around and then it became all-encompassing. I enjoyed coming across the wall-hung works, almost as though through clearings in a forest, where you will get a line of sight at certain points in the installation. I really enjoy making large physical heavyweight sculptures and also working with textiles. I studied textiles for a little bit before going on to fine art and there really was a hierarchy between disciplines. I can naturally work with textiles, I have the skills, but it took a long time before I was confident introducing them into my practice. The first time I introduced textiles was for my museum show at The New Art Gallery in Walsall. I had made these huge plaster slabs and they weighed three hundred kilogrammes each. We had to make homemade gantries to hoist these works up and it would take a day to move each work around in the studio. It was this massive endeavour. In one of the other rooms, I had crochets that were seven metres by two and a half metres and dyed with handmade dyes from a bouquet of flowers. I carried that work up in a Sainsbury’s bag on the train. What was amazing for something so materially slight was how it occupied space in the same way as those really heavy sculptures. That was really eye opening for me. Do you feel there is more respect for textiles as an art form even since you studied? It’s obviously growing out of a very enclosed idea of it as a predominantly female craft. Definitely. It’s completely accepted now. Textiles at Goldsmiths was led by some very eminent feminists and it was so loaded as a material that you felt you couldn’t use it. It’s not just women using textiles now. It’s the same with ceramics—ceramics used to just be a craft and now it’s everywhere in art. I felt, especially seeing this piece, there are some parallels with Phyllida Barlow’s practice. Is she someone who you admire? Where do you tend to go for inspiration when you’re beginning a body of work? I spend a lot of time reading books, browsing the internet, looking at images, at other artists work. Then I’ll have an initial idea, go to the studio and try it out. It will inevitably fail but it will lead to something else. Slowly the works will develop. I think the best thing about this life is that you never know what you’re going to make next. I’m very lucky in that I’m offered shows in a variety of very different sites, I’m not always in a white cube. I took over one of the oldest academic buildings in Berlin which is a disused anatomical veterinary theatre. In order to respond to that space I made a particular piece. I also worked at a site in a very remote part of Norway on the North Sea. It was a burial ground. When you work with such spaces you can’t help but be influenced by the history of the site. It’s interesting hearing you mention the burial ground, as also with this show there is the notion of life and death in the soil. Would you say that’s a running theme for you? I think much more when I first left college, I was interested in that idea of mortality and I think those ideas have developed now, the themes have widened. Now I’m interested in the ideas of memory and time passing, but ultimately, it’s the fragility of life. Life and death go hand in hand so when you’re thinking about and exploring the fragility of life you end up talking about death at the same time. It’s inescapable. By making work that is less literal and obstructing your ideas you are able to widen the conversation around the works. Sometimes it even just speaks about the process of making art. You’re not making work in isolation, it is in the context of the whole history of art.